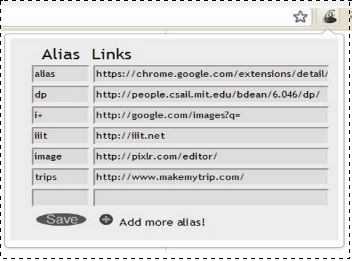 Alias Links is specially for those people who hate to use mouse. This extension will let you to keep short single word names for your URLs that you feel difficult to remember. It's always easy to relate things with real objects and hence that's why we never forget real objects name and things related to them. For these related things we may not be able to remember their names but we can explain them. For example, I never remember the login page url for ICICI bank web site. So I kept a small word "bank" as an alias for login page url of ICICI bank. Whenever I type bank on address bar. It will take me to ICICI login page. So now I don't need to navigate page 3-4 times for the same purpose. When you use bookmark extension, you may have to click atleast twice and then you will go to the desired url. So basically, you keep a small name for a particular url whatever the first thing pops up in your head after looking at the site pages. You alias the link url to that name and save it. Next time whenever you type that name in the address bar you will be redirected to that site. To avoid the google search redirect page, use "a" and space in the address bar and then write the alias name. There is a search query option as well where we can set any name and "+"(so it will become "name+") for name and then add link "http://www.google.com/images?q=" for google images search and save it. Now to use this type "name word"
To use this functionality, write "i gallardo" in address bar then it will redirect you to gallardo google image page. You can sync all your chrome data with multiple computers where you are running chrome. Please follow this link http://www.google.com/support/chrome/bin/answer.py?answer=185277 . If you want only extension data to be synchronized then select only extensions form the options given in above link. 1. Find "Local Storage" directory in chrome installed directory. On Ubuntu it will be located at "~/.config/chromium/Default/Local Storage". On Mac it will be located at " ~/Library/Application Support/Google/Chrome/Default/Local Storage"
"chrome-extension_hnmffkbofelpmfnimaicmkdhimnaegla_0.localstorage". Copy this file (from the existing Alias Link Computer) and put it in the "Local Storage" of Chrome directory in new computer. Make sure the existing file gets overwritten while pasting into new computer. This way you will get all your existing Aliases in new computer as well. The other day I was going through the comments of Alias Links and I figured out that still there are many requests which I haven't completed. Its kind of hard to keep track of enhancements you are asking in Chrome Alias Links reviews. I thought it would be good if we can list all enhancements over there to keep track of everything. Please leave your comments with your valuable suggestions, It will help me to improve extension. Here is one suggestions I have. Please let me know your thoughts about it. What if your aliases are kept safe and you don't have to worry about the loss of aliases, system crash, formatting system, switching OS, no worries of importing/exporting? It can be done by using a small portal which will be synced with your Alias Links chrome extension. If you login through Alias Link extension, then you can access your global list of aliases on any system you use. When you are logged in and you save the alias links on your system, it will automatically populate the aliases on site as well. There is one big advantage I see. If your system is shared by many people and you don't want to share your aliases with others then you have full security by using the site. You login the alias links portal through your alias link chrome extension to get your list of aliases and use it. Once you are done, just logout Alias Links simply or it will be logged out automatically if you close the chrome. If you don't login then you will access your local stored aliases. Thank you for writing your suggestions. I can't find a support link anywhere so I'm posting here. Alias Links does not appear to be working anymore for me. Typing "a" and a space doesn't change the address bar and typing "a", space and an alias just goes to Google search. I tried a disable/enable but there was no change. I haven't tried a reinstall as I'm not sure all my aliases will be restored. Hey Sean, sorry for late reply. I am not sure why that is happening for you. But you can reinstall it after taking the backup of your aliases. I have mentioned in this blog how to take backup and put it back in its place. Please let me know if you need further assistance. I didn't get any mail from your comment so couldn't check on time. Sorry again for late reply. If you are using windows then location will be.